A second birthday and the birth of a race…. Sunday was a big day. Finley turned 2 years old. As I woke up at 4:45 AM to get ready for Ladybug Run for CDH Awareness I had a little time to reflect on what this day meant. It was such a powerful day on so many levels. As I held Finley in my arms before I left for the morning, I once again went back to two years ago when I also got up very early to go to the hospital to be induced. I would be meeting Finley for the first time, not knowing if we would have minutes together, days, weeks, or years. The tears began running down my face because I am filled with such joy that I have been able to have 2 years with this amazing little girl. She is determined, feisty, so funny, so beautiful and I just know the Lord has special things in mind for her. He chose ME to be her mother. That is a honor I won’t take lightly. The race was a HUGE success. I will write more about the race on my other blog http://www.onethousandtwelvemiles.blogspot.com soon. But some things I want to mention now. God was SO present. I got chills over and over when I think about how God made this happen. I know God planted this seed in my heart, and to have followed him and listened and only blessed me so. I didn’t know anything about creating a race. But that didn’t matter. God broke down EVERY barrier. Brought me people with wisdom and expertise, friends with contacts and heart to serve, donations, sponsors – everything fell into place. 237 adult registrants and 50+ kids. For a first year race – these are AMAZING numbers. My dear friend Cody prayed before the race. She is such a powerful speaker – I was so blessed she agreed to do this for us. I was nervous how this would be recieved by everyone, as it is not standard practice to open a race in prayer – but it was important to me. She read from Romans 8 “37 No, in all these things we are more than conquerors through him who loved us. 38 For I am convinced that neither death nor life, neither angels nor demons,[k] neither the present nor the future, nor any powers, 39 neither height nor depth, nor anything else in all creation, will be able to separate us from the love of God that is in Christ Jesus our Lord.” I almost lost it completely it was so fitting for this day, for everything we have been through. I got several comments from other CDH parents about how the day was healing for them, and lots of thank yous. I am just so humbled and thankful to be able to serve. To use my gifts. I can’t wait to see where this all takes us. To see all the people wearing Ladybug shirts, costumes, to see the day unfold after months (years actually) of planning – it was just incredible. Running with Finley in the Diaper Dash (though she didn’t actually want to go towards the finish line) was so sweet. It was a perfect day – even though MANY things didn’t go as planned. Somehow I was ok with it, because this day actually happened. This day that was just a seed planted not quite 2 years ago.. grew and grew and took on a life of it’s own… and God willing, it’s only going to get bigger. Thank you again to everyone that has supported us over the past 2+ years. Our prayer warriors have sustained us – you have prayed for miracles and we received them. We love you all more than words can express. 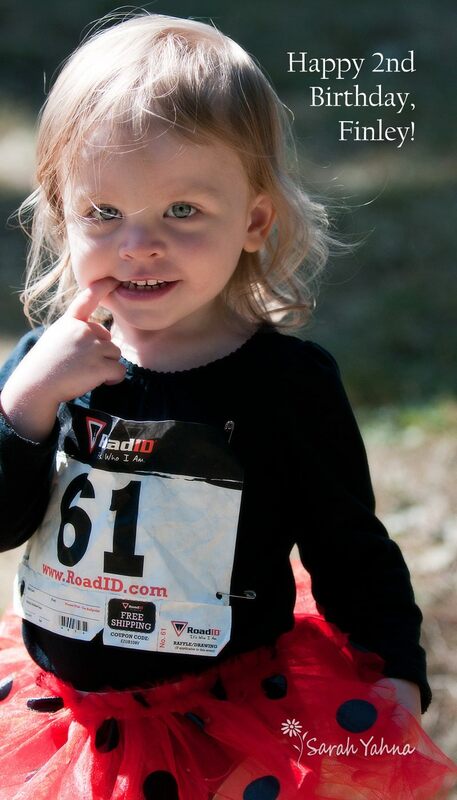 Author lizdooleyPosted on August 14, 2012 Categories healthy toddler, ladybug run, Uncategorized5 Comments on A second birthday and the birth of a race….